Each day with trust and good faith we send our beloved children off to school. We assume they arrive safely, enjoy time with their friends and learn their lessons. We think we know where they are and who they’re with. But life can change in a heartbeat, so can circumstances, places and people and, as a result we never remain the same. Change is often good, sometimes bad, but always constant. 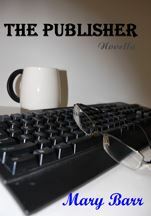 The Publisher takes you into the lives of the Smelt family. Joe, Suzanne and their two children, six year old Libby and thirteen year old Connor. It is a normal school day just like any other, until Joe – the publisher – begins reading a manuscripts. In the manuscript he learns that his children are not at school. They have been kidnapped and are being held hostage until the ransom is paid. Each detail of what he must do is precisely laid out as another page of the manuscript unfolds. Suzanne has done someone wrong and, if she can right the situation her children will go free, if not, they will die. And so, they sit and wait for the knock on the door and the next installment of the manuscript that holds within its pages their children’s fate.